The interior design scheme for our beautiful new care home was created especially for Fairfield by Jacqui Smith of HomeSmiths. HomeSmiths is a family run interior design practice that specialises in healthcare and care homes, providing a full service from the design to the installation. Early in 2017 Fairfield invited HomeSmiths to tender for the interior design of our new build care home in North Oxford. The brief was to design a scheme that was warm and welcoming for the residents as well as one that would appeal to visitors, especially members of the younger generation who would be invited to the home for activities, and one that enhanced the beautiful light and airy architectural style of the new home. HomeSmiths also felt that the interior scheme needed to connect with the environs of the new building and in doing so, make residents feel more established in their new home more quickly. With this in mind HomeSmiths proposed a botanical theme, which they felt, met the brief with its broad appeal, obvious connection with the local environment, potential for plenty of intergenerational activities within the home and the colour palette options it could offer. Interior design plays an important role in how residents feel in a building, how safely they navigate the home and how settled they feel. Good interior design should help support people in their day to day lives and keep them independent for as long as possible. 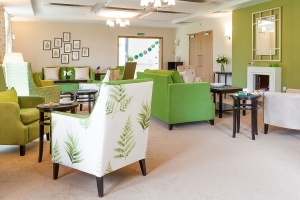 Certainly the furniture, the colours and the interior design has been much admired and commented on by visitors, guests and residents when the first arrive at Fairfield. Very impressive! Lovely décor and furnishings. Filled with light, very cheering. Attention to detail excellent and great facilities. Taking pride of place just inside the new reception is a large tree collage that was produced by Fairfield residents in 2014. Each leaf was lovingly painted by a Fairfield resident and stuck on the tree. The collage used to hang in the lounge area of the original Fairfield and is now a relevant and reassuring presence in the waiting area. It was this tree, along with the large glass windows and the views over the garden, that gave HomeSmiths their inspiration to create a botanical theme.